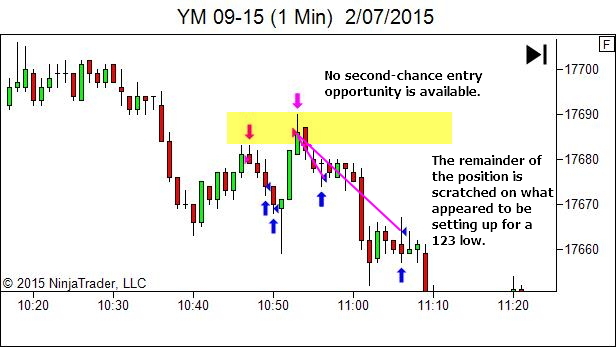 Let's examine a recent emini-Dow trade from Thursday 2nd July 2015 which resulted in only a partial entry. We'll look at my decision making and see if perhaps it could have been improved in some way, allowing for a full-size position. First, let's start with the higher timeframe to get some context. You'll note that the market opened within the prior day's range, just below the high and flirted with this level for the first 20 or so minutes before settling into a nice downtrend for the next several hours. However, while the session at the time of trade entry was trending with a downwards bias, it was certainly lacking in any real bearish strength as seen by the significant overlap between candles. This will be obvious on the trading timeframe as well, as we see below, where the trend structure is more a series of stair-step ranges rather than a nice stable downtrend. 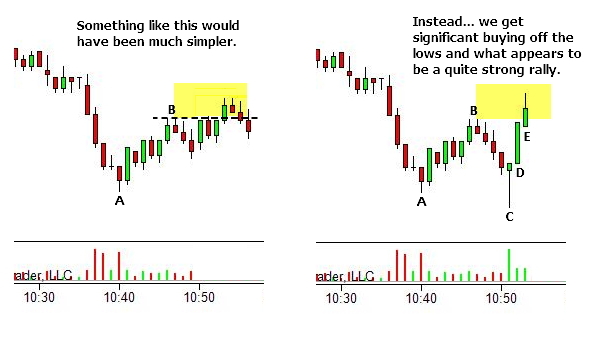 Often in these situations it is simpler to "step back from the charts" and view the market as a series of ranges. 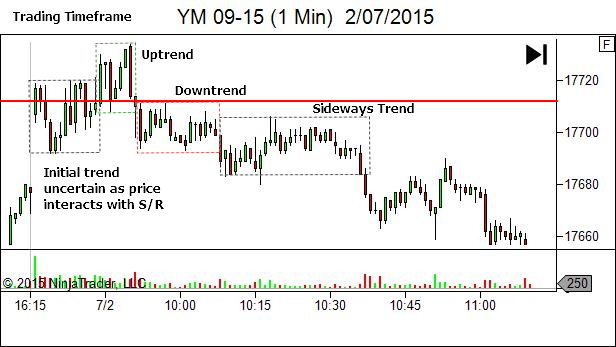 Look to the left and find the key swing highs and lows and levels which contain the current price action. As you can see below, it's a little simpler to visualise as a series of downwards-stepping ranges. In any case, regardless of how you choose to view the trend, I would hope the reasoning behind the trade is fairly obvious. The trade is a pullback within the "messy" downtrend structure, aiming for entry as price retests the area of prior volatility contraction and expansion. 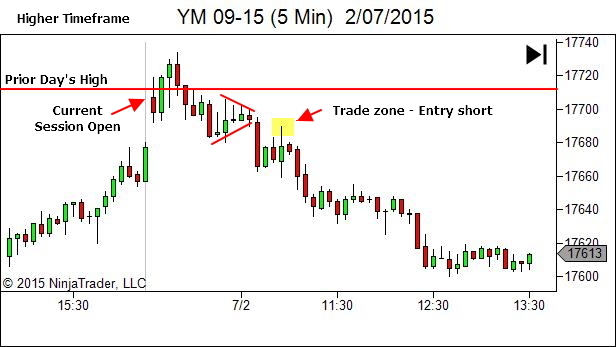 Let's zoom in a little to the trading timeframe and look at the lead up to the trade. 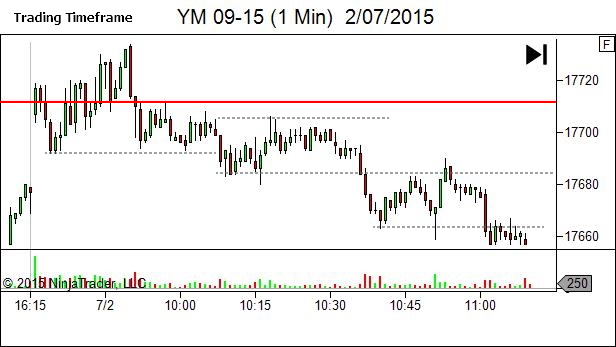 From a structural perspective the trade location is perfect. 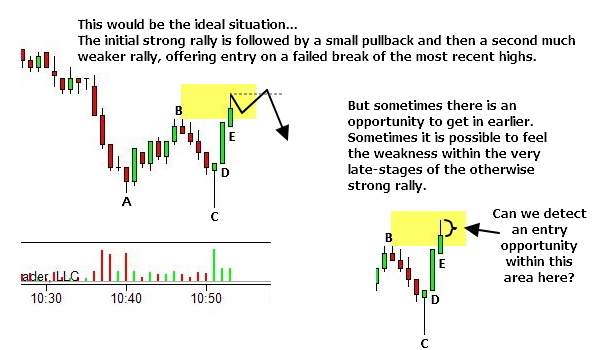 But from a strength/weakness perspective the rally makes it REALLY DIFFICULT to get in. If we had weakness throughout the bullish price swing it might be easier. It's this engulfing action, where candles C, D & E engulfed almost the whole of the prior structure in basically two minutes, that makes it a difficult decision. Note how candle C broke swing low A to achieve new daily lows and then immediately rejected the break. When faced with a strong rejection such as this I will always anticipate it moving to break the prior swing high (in this case swing high B). Expect the strength to be sufficient to carry price through at least that far (until proven otherwise). So I had absolutely no desire to short this market below swing high B. The question is though, is it safe to short on a break above B? I like to fade weakness. I didn't like the strength coming off the lows… so I sat on my hands till above swing high B. If it fell from before B, so be it. I'd just move on to the next opportunity. But as it broke above B, my thought process was clear. I REALLY liked the trade location and would seek to enter a position in that area, unless price shot straight through it with strength. The ideal scenario was as shown above and to the left. I'd definitely want to be in a full position if that occurred. But what if it just stalled and fell, without offering that second-chance entry? 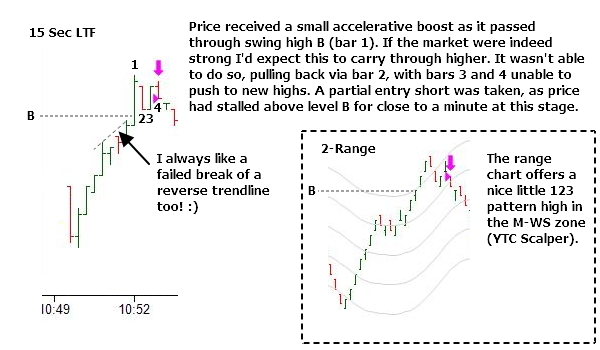 It was decided that if I could find some weakness within the latter stages of the rally then I'd enter a half-size position, with the intent to add the rest on a second-chance, weaker retest. Let's look to the lower timeframe. I'll show two different perspectives, one from the time-based lower-timeframe chart and the second from the range chart. 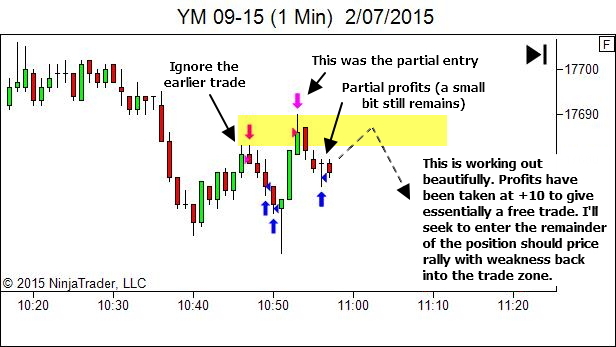 Market context and the trend structure, although slightly messy, show a slow bearish bias to the session. I expect this to continue until it can prove otherwise. 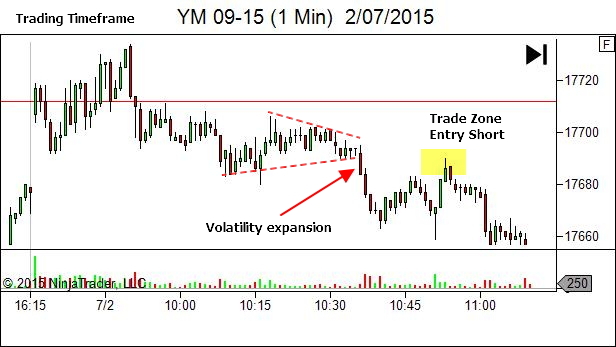 The trade area is high quality – a pullback to an area of volatility contraction and expansion. I really want to get a trade on in this area, if at all possible. However, there is strength off the lows as the recent break to new session lows is rapidly rejected. I avoid any thoughts of trading until price breaks the intermediate swing high, with the intention of entering a partial position on the first sign of stall above that swing high. I will then seek to add the remainder of the position on a weaker retest, should it occur. Could the trade fail from this point? Of course! Any trade can fail. There are never any guarantees. We can't know the outcome until it occurs and we can see it with the benefit of hindsight. All we can do is make a decision and then act to manage that position as new data unfolds. In this case, my entry decision is made with only MINIMAL evidence of weakness at the tops. Given the quality of the trade area, I'm happy to take a partial entry at this time and will seek to scale in the remainder should further weakness show itself in the entry zone. Let's step through the trading timeframe to see the outcome. It's always tempting to look at a price sequence after it's over and assume that we should have (or could have) made the optimal decisions necessary to maximise profits through that sequence. But the reality is that we operate in an environment of uncertainty. And we operate in that environment with an imperfect and often flawed decision-making ability. All we can do is make our decisions and then manage the position as best we can in response to the any information that comes to light after our entry. On review, I still feel that the partial entry decision was right. The trade area was good. The initial entry was sound. But there was too much strength off the lows for me to risk a full position at this stage. 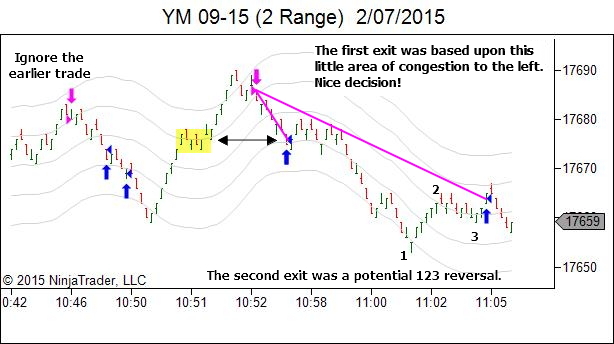 And I still feel there was a better-than-even chance of a second retest of the entry zone. This time though, the second entry just wasn't available. Partial position profits are booked. It's time to focus again. The next opportunity could be just around the corner. Another, as usual, great article. I’ve found that lately I’m not reading any other trading books or visiting any other trading sites. My goal in trading is to make money and with YTC PAT, YTC Scalper and all the articles on your website I’ve found everything I need to accomplish that goal. Why clutter my mind with anything else? Most of what I’d wasted my time and money on previously turned out to be rubbish anyhow. Thanks again Lance for what you do. You’re the real deal. Thanks Elliott! 🙂 You’ve made my day. I’m pleased I’ve been some help so far along your journey! Have to fully agree. Nice trades too. I havent seen any other author detailing the “thought process” so minutely. In the yellow re-test zone, do you again look for some trigger or just put a limit sell order before hand? Regarding the yellow zone. Have a look at the chart showing both the 15 second and 2-range charts segments. They show how it was a blend of feel and pattern-based entry. The same kind of entry would most likely apply on any subsequent retest. It’s rare that I just blindly place a limit order without waiting to see how price behaves in the area. 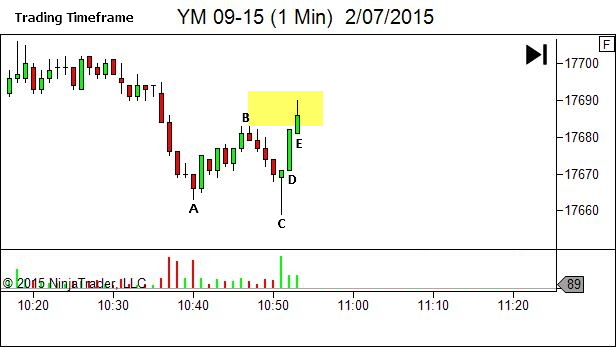 To do that I need price to be leaning against some really good structure that should hold the move.